DPS teaches 19 free workshops to educate interested citizens and business owners about the latest developments in procurement and certification. 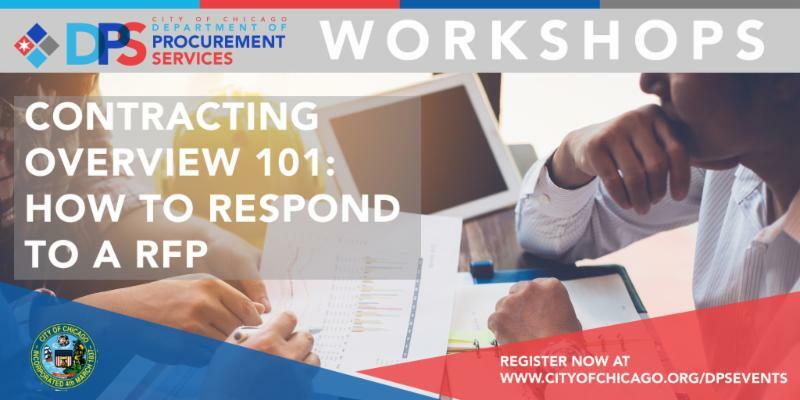 This workshop is designed to teach business owners how to respond to a City of Chicago RFP. Using advice from seasoned professionals, you will learn specific details about what evaluators look for in a RFP and how to avoid common mistakes that can hurt your chances of a winning bid. Attend this workshop and you will learn how to navigate RFP specifications efficiently. As of January 1, 2016, DPS no longer accepts paper applications for M/W/VBE certification. This workshop will give a hands-on experience filling out the online MBE/WBE/VBE/BEPD Schedule A application. During this training you will learn where to find the online application, what documents are needed, and how to upload the documents. Be prepared to work on your application with the assistance of a subject matter expert. NOTE: Please bring your username and password for the Certification & Compliance System (C2) and business Tax ID number with you to class. An Economic Disclosure Statement (EDS) is required of all bidders seeking to do business with the City of Chicago. Through the EDS, applicants make disclosures required by State law and City ordinances and certify to compliance with various laws and ordinances. This hands-on workshop will go over the proper way to fill out an EDS and how to submit via the online portal application. Please note that all vendors must bring their FEIN information in order to create an online EDS account and complete the online EDS application. The American Contract Compliance Association (ACCA) is a national nonprofit organization dedicated to ensuring equitable employment and contracting practices within public and private sector institutions. ACCA’s membership consists of public and private sector Affirmative Action, Contract Compliance, M/W/DBEs, Labor Compliance, Economic Business Development and Equal Employment Opportunity professionals from across the nation. The City of Chicago CPO, Shannon E. Andrews will be leading a Workshop entitled, “Chicago’s Innovative Solutions for Opportunities for All” on Wednesday, August 29, 2018 from 8:45am-10:15am. For more information about ACCA, click here. The CDA is committed to administering a robust community outreach and workforce development program. These career fairs are designed to ensure that hiring opportunities are afforded to residents from all corners of the city. 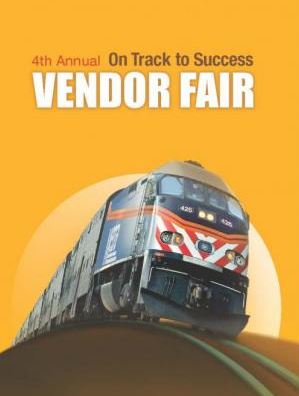 Metra is hosting the 4th annual On Track to Success. Join Metra as they recognize and honor prime contractors, subcontractors, assist agencies and staff members that have provided exceptional service and promote diversity and inclusion. 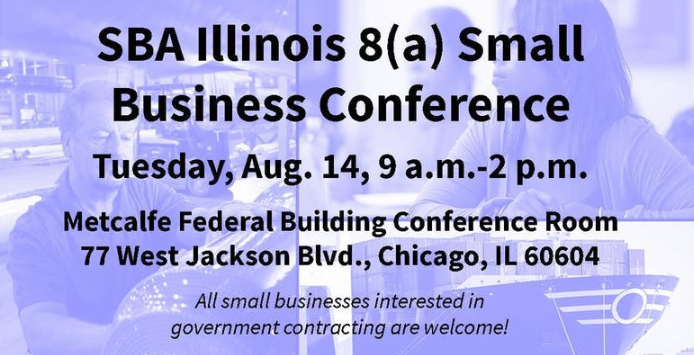 This event will provide small businesses access to prime contractors, a chance to register as a Metra vendor and an opportunity to attend a free educational workshop. 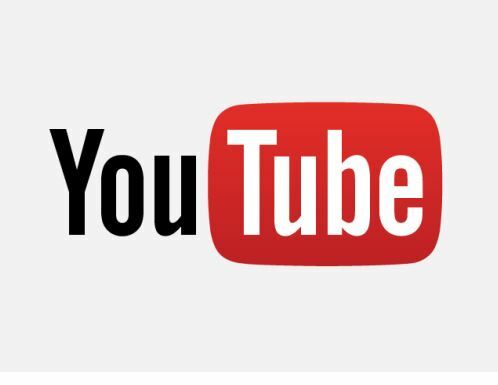 The Chicago Transit Authority presents “Your New Blue Small Business Educational Series”. Learn how your small business firm could effectively participate on CTA contracts. Participants will learn from key CTA personnel and industry leaders about topics that focus on procuring business opportunities, managing projects, risk management, payroll and successfully closing out projects, among other areas. Participants will also learn more information on becoming DBE Certified with the CTA. Upon completion of the program, participants will have the option to receive OSHA training and CPR training hosted by CTA. Participants will also receive a certificate of completion at a private networking event, hosted by key CTA personnel, where you will also have the opportunity to meet with CTA prime contractors. 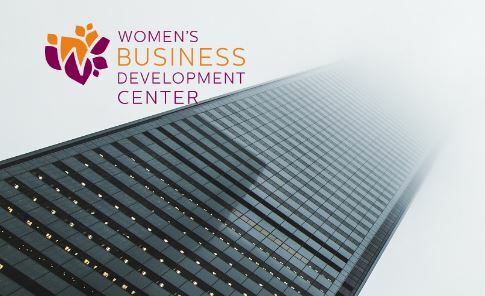 The Women’s Business Development Center invites you to participate in a special procurement event to discuss Growing Your Business in the Financial Services Industry which will be hosted by PNC Bank. If you are interested in doing business with PNC Bank or in other financial services sectors, this event is strongly encouraged to attend. Additionally, DPS General Counsel, Gina Oka will be on a panel discussion on how to do business with the City of Chicago and the programs and incentives offered for small, local, minority, veteran, women-owned, and businesses operated by people with disabilities. 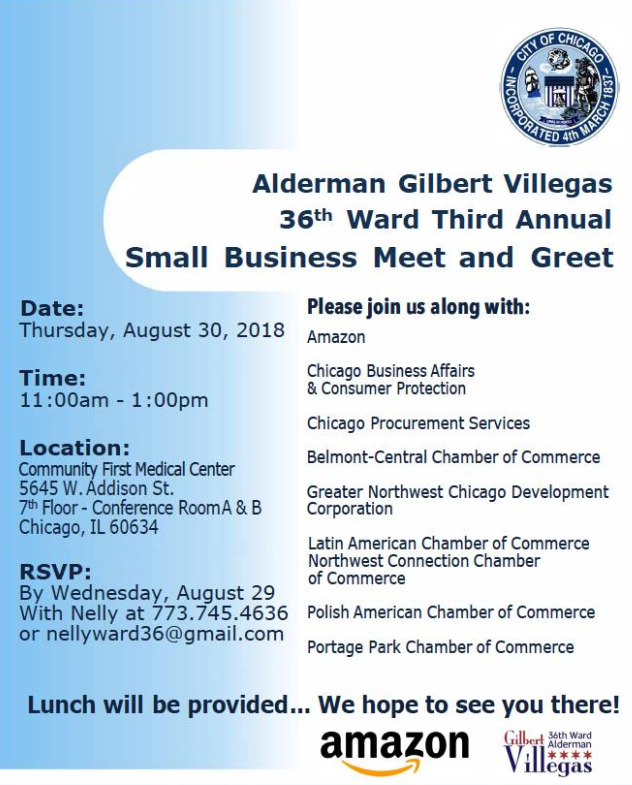 Alderman Gilbert Villegas is hosting the Third Annual 36th Ward Small Business Meet and Greet. This is an excellent opportunity to network with other businesses and gain information from other government agencies. DPS will be in attendance to provided information on how to do business with the City of Chicago and information about the programs and incentives for small businesses of Chicago. Bid opportunities for goods and services are primarily awarded by a competitive bid process. Contracts are awarded to the lowest, most responsible & most responsive bidder. The weekly Bid Opportunity List (BOL) is the resource to find currently advertised contracting opportunities with the City of Chicago. Bid Opportunity List by clicking here. Look for upcoming pre-bid meetings. Pre-bid meetings are a good opportunity to meet the contractors who are going to bid on projects, especially if you are bidding as a subcontractor. Also, as a contractor you get to hear all the details of the project and you have an opportunity to ask questions specifically relating to your business. About City of Chicago Department of Procurement Services: We are the contracting authority for the procurement of goods and services for the City of Chicago. We pledge to work together as a team and with our customers to guarantee an open, fair and timely process by establishing, communicating, and enforcing superior business practices. Integrity, Public Trust and the Law are our guiding principles. 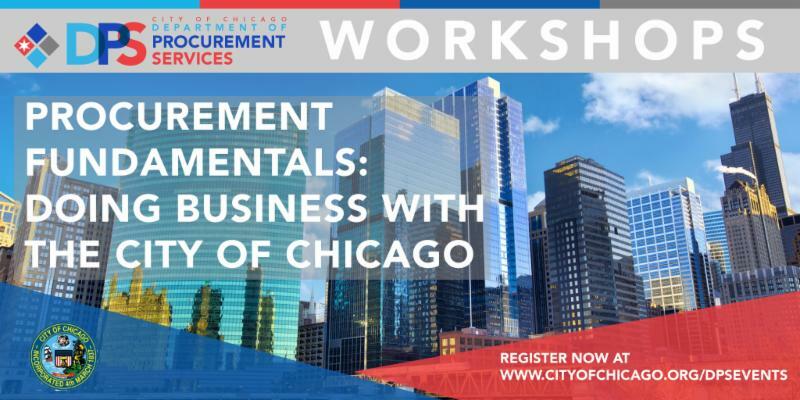 Enterprise (MBE), Women-Owned Business Enterprise (WBE), Veteran-Owned Business (VBE), Business Enterprise for People with Disabilities (BEPD), Disadvantaged Business Enterprise (DBE) and Airport Concessions Disadvantaged Business Enterprise (ACDBE).This workshop will provide detailed information on who is qualified to be a Chicago certified form. Learn out what documents are needed when submitting an application and how to avoid the most common mistakes in the certification process. Subject matter experts will be on-hand to answer all your questions about common certification topics. Do you have questions about how to become a successful bidder on City contracting opportunities? Unsure where to begin? This informational workshop highlights the role and responsibility of DPS in the City’s purchasing process. 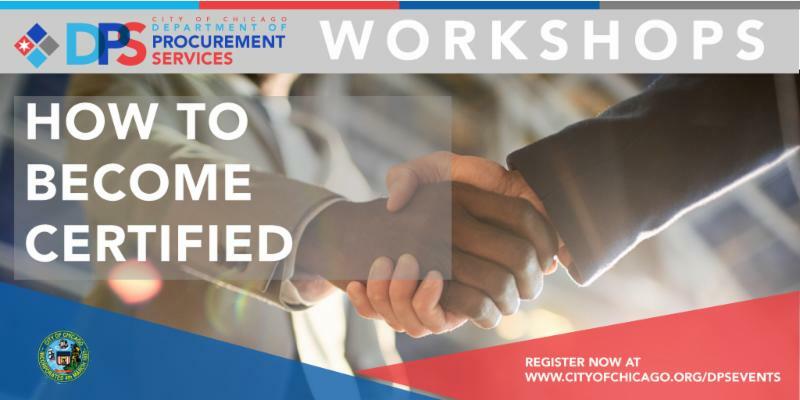 Come learn about different procurement methods and the laws which govern the procurement process. Once completed, you will better understand what it takes before you start the bidding process and your responsibilities after you have won a contract with the City of Chicago. 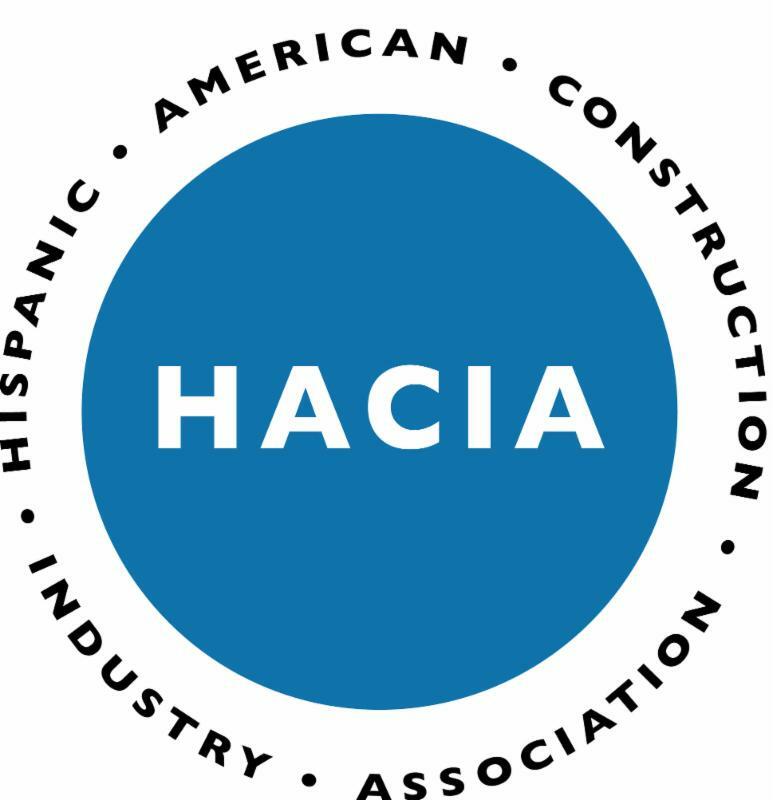 The Hispanic American Construction Industry Association (HACIA) is hosting Training Workshops for small businesses. The June workshop focuses on time management. This workshop explains best practices commonly employed by a small business including pareto analysis, ABC method, Eisenhower method and POSEC method. Attend this workshop to learn more about this innovative program that can take your business to the next level. Learn what it takes to grow a business, how to increase your staff, create effective marketing strategies, and develop important business relationships. This class with teach you how to apply for this free, competitive application program sponsored by the Goldman Sachs Foundation. DPS is continuing on the next phase of start-to-finish purchasing modernization via the implementation of a comprehensive eProcurement system. eProcurement applies digital technology to the acquisition of goods and services. It will allow DPS to collaborate with City Departments to create solicitations and contracts online, greatly reducing the time it takes to complete procurements. 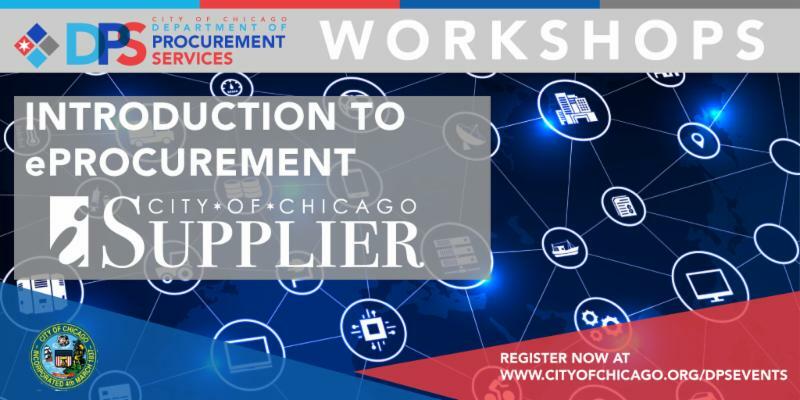 Come watch a demonstration and learn about iSupplier registration, how vendors will submit bids and proposals online, and how to view contracts and payments. The City of Chicago’s two major airports (O’Hare and Midway International) create more than $45 billion in annual economic activity and create 540,000 jobs for the region. This workshop focuses on aviation-specific contracting opportunities in construction, work services, operations and maintenance. 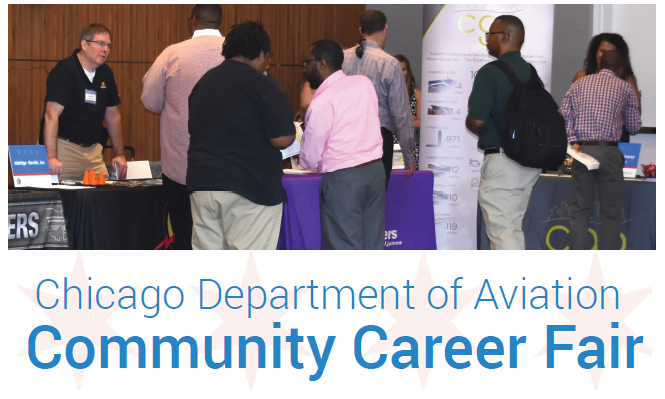 Learn about the Chicago Department of Aviation and how to do business with the City of Chicago at its major airports. DPS is the certifying agency for the following certifications: Minority-Owned Business Enterprise (MBE), Women-Owned Business Enterprise (WBE), Veteran-Owned Business (VBE), Business Enterprise for People with Disabilities (BEPD), Disadvantaged Business Enterprise (DBE) and Airport Concessions Disadvantaged Business Enterprise (ACDBE).This workshop will provide detailed information on who is qualified to be a Chicago certified form. Learn out what documents are needed when submitting an application and how to avoid the most common mistakes in the certification process. Subject matter experts will be on-hand to answer all your questions about common certification topics. The Annual 8(a) Small Business Conference will feature workshops, panel discussions and matchmaking. If you are interested in expanding your business footprint into federal contracting or growing relationships with state, local and commercial partners, this is the event you will want to attend. Are you interested in becoming a certified Disadvantaged Business Enterprise? Would you like to learn more about upcoming contracting opportunities with the CTA? Are you on a CTA contract and need to know how to manage your payments? Receive knowledge and first hand tips that will successfully help small businesses drive down the road of a successful contracting with the CTA. 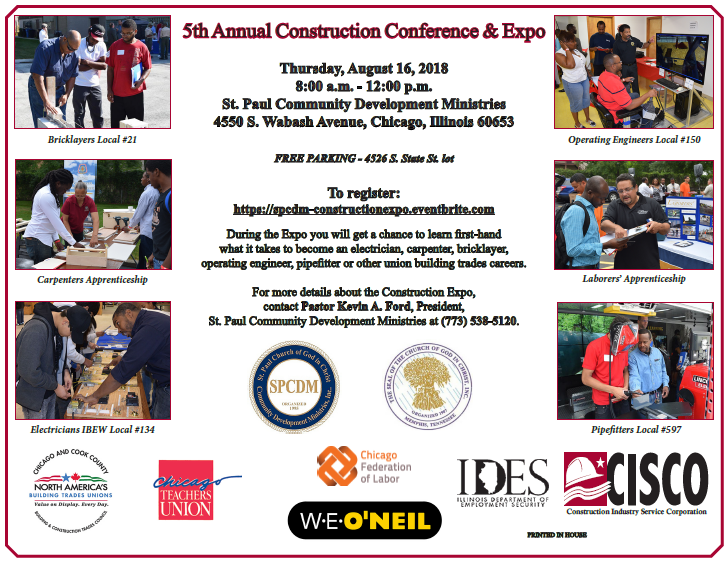 St. Paul Community Development Ministries, Inc.
St. Paul Community Development Ministries, Inc. is hosting the 5th Annual Construction Expo from 8 a.m. to 12 p.m. This Expo is designed to provide individuals interested in U.S. Department of Labor approved apprenticeship programs with all the necessary information and resources essential to succeeding. This event will also provide hands-on workshop opportunities and networking to pursue a career in the construction trades and other related industries. We pledge to work together as a team and with our customers to guarantee an open, fair and timely process by establishing, communicating, and enforcing superior business practices.Integrity, Public Trust and the Law are our guiding principles. City of Chicago Assist Agency, The Illinois Black Chamber of Commerce is hosting the 2018 Annual Convention. This year’s convention will include one-on-one matchmakers meetings with key decision makers for procurement as well a networking opportunities for attendees looking to do business with the public and private sectors. 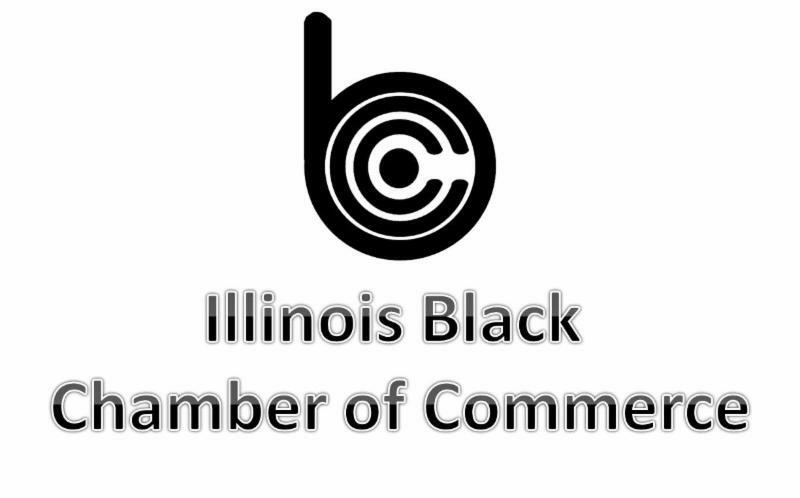 The Illinois Black Chamber of Commerce (ILBCC) is the largest Black trade organization in the state of Illinois and works to build and support black-owned businesses throughout the state. Additionally, join DPS CPO Shannon E. Andrews and CDA Commissioner Jamie L. Rhee for a welcome reception and a fireside chat with “Women in Power”. The LGBT Chamber of Commerce of Illinois is hosting the Engaging the LGBTQ+ Community: Talent, Revenue, & Supplier Diversity event. This event will include a panel of leaders who will share insight on how to be successful in engaging the LGBTQ+ community and how these actions impact talent, revenue, and supplier diversity.